A herd of wild horses in the Heber-Overgaard area is at the center of a debate between the U.S. Forest Service, which wants to control the horses' population, and environmentalists, who argue they should be left alone. The Arizona Republic reported last month that the horses, which number at least a few hundred, are the subject of a management study being conducted by the Forest Service, although it likely won't be completed until 2016. Some of the horses may be descended from an originally wild herd, while others escaped from White Mountain Apache Tribe land and other places when the Rodeo-Chediski Fire tore through the area in 2002. Local resident Mary Hauser, who has tracked the horses for years, is fighting to prevent them from being rounded up. You can learn more about the situation at the Heber Wild Horses Facebook page. Horses are a beautiful part of Arizona's heritage and history. Leave the horses alone, how can you think about getting rid of them? There is nothing more majestic than wild horses. T Whom it May Concern: The beautiful Horses are a part of our American Heritage!! PLEASE leave them FREE!!! just like us Indians you won't be ok til we are extinct. Leave the horses alone ! These wild horses are an important part of Arizona's history; as a matter of fact, the history of the Unite States. We need to make sure the horses stay wild and free in the Apache-Sitgreaves National Forests. We need to only continue to educate all on the cooperation needed to make sure they are saef and free. People need to continue to not feed or water them. They are only looking for food and water as all animals are. Allow these animals to stay free on our American Lands. yes, let them stay. They are an essential part of Sitgraves Forest. They belong there as the trees do. Let them stay.in these times when we are losing all of nature, we need to start protecting it. Choose nature. What happens to them, happens to us. We need the wild. Keep the government away and let them be. What we really should be doing is rounding up all the government bureaucrats and figure out how to reduce that population. I agree Michael. I'd love to help if you get THAT round-up organized! Whether their ranks have had the introduction of domestic horses, the horse should be left alone. They are as much a part of our environment as any of the other wildlife. Our Federal Government has allows the BLM to manage wild horse's to near extinction. When was the last time one could count on the government to report realistic numbers? The BLM does not go out and watch these horse's like the advocates do, the advocates can trace blood lines back. These horse's have earned a place to be free. Without them, where would mankind be today? Wild horse's are out numbered on the range by close to a 100 to 1 and on some ranges far more cows over run the horse's. At some point we must stop and put away the greed before public land and it's wild life is decimated. We must leave some places untouched for the animals and the generations to come. These wild horses are a national treasure. We cannot let them be removed from our public land. That forest already has cattle grazing, which is fine but the whole thing cannot be turned into a cattle ranch. Leave Arizona's wild horses alone! To Whom it May Concern: Horses are a part of our American Heritage!! PLEASE leave them FREE!!! Just leave them be !! Why do humans have to mess up everything ??!!! Leave the horses on the land. They belong there and the land belongs to them. Horses have served man in wars, working, friendship and it is time they are left alone!! No more roundup!! These horses are an American treasure! It is important that they be left in the forest not only due to their historical value but because they are so loved by so many of us who feel fortunate to still have some wild horses in our great state of Arizona. I hope the Arizona Highways will do an article about them in their wonderful magazine. They could get some amazing wild horse photos! The U.S. Forest Service is going to be announcing their scoping summary for these horses in the very near future. Please stop with the round ups. There are so few wild horses left. We are already witnessing the extinction of wild horses across the US. Dont be part of that. Please just leave them alone. Please leave the wild horses alone. Taking them away from their home is a cruel, horrible thing to do. Think what horses meant to us from the beginning of settling this country. They do nothing to hurt any people or creatures. They live off the land in peace. Leave them alone! Please allow ALL of the horses to stay and breed. Are these lands needed for cattle grazing? I would rather see the land preserved for the horses and their offspring. Leave the wild horses & burros alone! We the people are tired of paying for round ups we don't even believe in! Let the advocates help manage the population along with BLM & DOI! That way we see what is going on! Let's work together! Be logical not & stop the removal of our wild animals. These horses are our National Treasures and should be protected at every level! When I see Forestry Service and The BLM remove cattle from public lands, then and only then will I believe Forestry and BLM actually care about the ecosystems, especially that of Heber Forest. Cattle destroy the land , horses add to the ecosystem. I'd rather see a horse than a cow any day. Forestry, BLM, F&W act as a mercenary army for the ecoterrorist ranchers. I wouldn't trust a thing they said nor any study they did. As a long time Arizona citizen. it saddens me to think anyone would consider harming the well being of these beautiful animals. Please all of us, protect and cherish them. The wild horse populations are tiny compared with the cattle population. Wild horses are a natural part of the landscape and are valuable in their role of managing the environment. It makes environmental and economic sense to maintain a wild horse population. As a Federal Tax Payer from New Jetsey, I strongly oppose any removal of these horses from the US Forest. I also oppose any personal /commercial cattle from being allowed to graze in such a forest that my tax dollars help maintain. These horses are part of the ecosystem there and we here on the East Coast travel to your state just to see them. These wild horse's have a very important place in the echo system. These horse's add up to a few hundred. I'm asking you to leave these majestic horse's alone . Wild horses do much to maintain balance in a healthy eco-system..Whereas a cow has 4 stomachs and pretty much what comes out of the other end is WASTE..with horses, many of the nutrients needed by the soils are retained in their manure. They do a good job of re-seeding, replenishing..they are a vital part of keeping systems healthy..Please, no more removals for the sake of beef cows.. 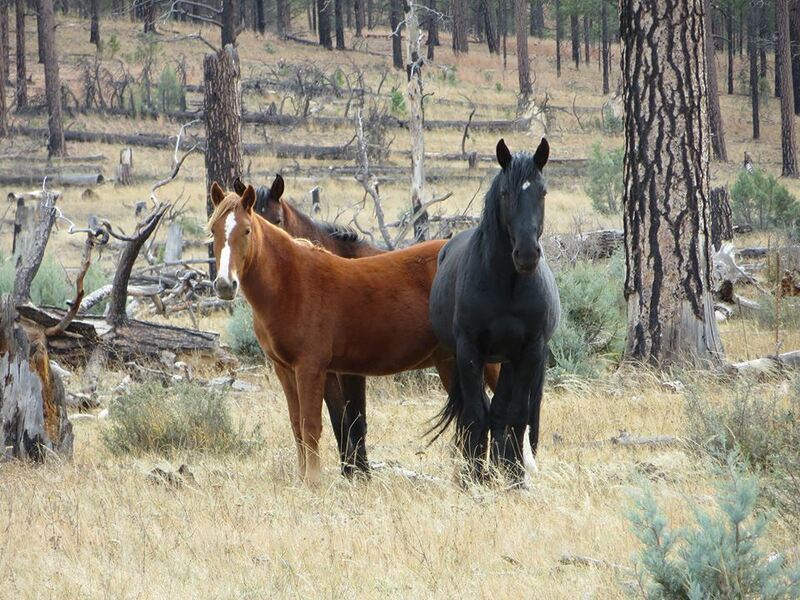 These horses should stay wild and free in the Apache-Sitgreaves National Forests. That they are an important part of Arizona's history and an integral part of the ecosystem. This is where they belong, this is their home! The Heber Wild Horses deserve to be able to stay where they are! It is environmentally, economically, and even more important MORALLY imperative that these horses be allowed to live, and to live on their land. To remove them is simply criminal and unacceptable! These are OUR horses, protected by the 1971 Wild horse and Burro Protection Act. BIA and Forest Service need to obey the law, not ranching and petroleum interests. These horses in the Apache-Sitgreaves National Forest should stay where they've been for years. They like wolves are essential to the environment. Do not remove them or inject them with anything. Mother Nature takes care of her own and we humans need to respect her. Please leave these animals alone. The current practice of using helicopters to herd wild animals into a small corral is barbaric. The damage to babies who must run at 'extreme terror speed' is huge. Some babies can't keep up. If mom doesn't notice her baby dropping back, the little one is left all alone to starve to death. Herding wild animals onto trucks to haul them to corrals in the middle of nowhere, with no shade, no grass, no running water, is barbaric. Once at these detainment camps, family groups are separated with no regard to where each animal is shunted off to. These animals are part of our heritage, and I sincerely hope that the BLM will agree to let other groups offer and implement different ways of maintaining this population all over the US, not just in the Heber area. Mares can be darted with contraceptives. If the stallions can't find a fertile mare, they won't be creating more horses. The big money ranchers think that because they lease ground from the BLM, they have the right to dictate what happens on that land. However, studies show that the cattle, numbering approximately 20 cows to 1 wild horse, have decimated the land much more than the horses ever will. Shooting a very pregnant horse in the head because it could not keep up, and leaving the foal to die inside the carcas, is such a huge case of animal abuse that I wish the taxpayers and citizens of this country would press suit against every BLM employee and contract employee of the BLM. I'm shocked, angry, sad, mad, and dejected that our animal welfare groups have not put a stop to this already. These horses need to remain where they are,and to remain free.Yes,some of these horses have entered this area through escaping a fire,and human abandonment...but in the meantime they have bred,and maintained family units for many years...so how is one to determine which horses are the so called original wild ones....I cannot even wrap my head around how the destruction of these herds/bands of horses,can be tolerated by anyone....how in the heck can this even be ok ??? These are PUBLIC lands,and the PUBLIC wants wild horses running free as they were born to be. Leave the wild horses to roam free. Not sure why the government agencies think they need to "manage" the horses, mother nature will. They have obviously been there for years. This has to be a money issue! Please let them stay and use them to get tourists to the state. Horses have been here since the beginning of time. I am planning a trip this year just to go and view the wild horses. I'm so sick of these cattle ranchers commenting about wanting to shoot and kill these beautiful horses. These greedy welfare ranchers just want all the land, and unfortunately they have bought off the Forest Service and the BLM. These horses have thrived in the forest for hundreds of years, so clearly they don't need the government to "mange" them! These herds of horses are an important part of AZ history and they need to run free! The Wild Horses of the American West have protection from the Wild Horse and Burro Act. I ask why is it that our Federal government does not have to follow the law. The Wild Horses help form America, read your history. In my opinion the federal government should be ashamed. Our Land, Our Horses, Our Decision. Leave the Wild Horses Wild and Free. SPEECH OF HON. RAÚL M. GRIJALVA OF ARIZONA IN THE HOUSE OF REPRESENTATIVES WEDNESDAY, JUNE 6, 2007 ·Mr. GRIJALVA. Madam Speaker, I rise today to honor Arizona 's wild horses living in the Apache-Sitgreaves National Forests. · The residents of the State of Arizona deeply value these magnificent wild horses. These beautiful wild horses are truly the 'Living Symbols of the West,''' as described by the Wild Horse and Burro Act passed by Congress in 1971 to protect the wild horses of the United States . The Rim Country wild horses date back to mounts brought by Father Eusebio Kino, who began his 1653 mission to eastern Arizona by setting out from the lands of my constituency in southern Arizona and traveling across our State northeast to the 'borders of the lands of the Apacheria which border on New Mexico.' " These original Spanish horses are the great ancestors of the Mogollon Rim country wild horses. They were the mighty Andalusian war horse, whose origins go back more than 28,000 years to the original Iberian horse; the magnificent Spanish Barb; and the graceful and fluid Spanish Jennet, the mount of many of the great kings of Europe; and the strong bloodlines of these original horses appear almost unchanged in our Rim wild horses 400 years later. "Our Arizona Rim wild horses are the direct descendents of the Spanish horses prized by the conquistadors so highly that the foals were carried in hammocks to protect their legs until they were old enough to travel on the forced marches; and prized by the early cattlemen for their endurance and heart and were the very mounts of the U.S. Cavalry as they rode to protect and expand the American west. · The Arizona Rim Country wild horses living in Apache-Sitgreaves National Forests are a most precious natural resource to be preserved for our children and grandchildren who will be able to see them for generations to come." Sure, Forest Service and BLM, round up all of the wild horses and ship them off to slaughter houses in Mexico. Be sure to go along for the "show", and take your cameras. You wouldn't want to miss the opportunity to show your children and grandchildren photographs of what a great thing you are responsible for. If the Forest Service and BLM can't figure out that there is more than enough land for the horses to roam as God intended, then they should seek other employment.